Whether you're cool with serving kangaroo for school lunch or one has ruined your soccer game, you can probably agree that saving a marsupial from drowning is key-to-the-city worthy. We're not sure if that's still a thing, but someone should give these cops one anyway. On Saturday afternoon, this most commendable of events occurred when police in Australia dragged a drowning baby kangaroo from the sea at Safety Beach in Victoria and administered CPR to save its life. 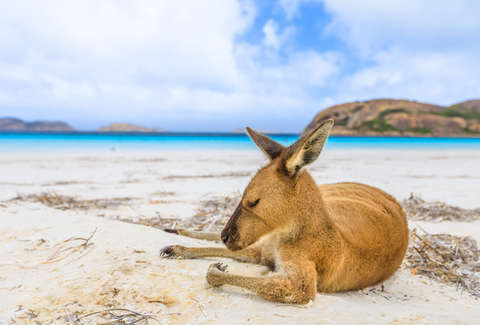 A resident named Mia Grant witnessed the kangaroo moving across the road toward the beach, according to the BBC, and saved it once before police arrived at the scene. Once the officers arrived, the kangaroo made another break for the water, presumably because it was scared and confused, and it was the cops' turn to chase it. The young kangaroo was soon submerged and in serious danger. "His head went under a couple of times and when his head popped up he was starting to spew out a lot of salt water which had a bit of blood and some foam in it. And that's a fair indication that we see also in people that they're going through a drowning event," the police explained to 7 News Brisbane. "I grabbed his tail and Kirby cradled his head and dragged him onto the beach and cleared his lungs to get the water out of him," said Srgt. Christopher Russo. "Then we just started to push on his chest and he started breathing again and I could feel a heartbeat." After they administered CPR, the kangaroo was taken to the police station and later retrieved by wildlife services. "We will let him recover at his own pace but he has a paddock full of grass and lots of water to drink and he seems very happy with that," Michelle Thomas, director of the local Animalia Wildlife Shelter, told the BBC.